second label wine (GB) Your browser does not support any audio element. Designation (also second label) for a price much cheaper and simpler line one winery that's under different names than the one Grand Vin (First wine) is marketed. This is especially common in the Bordeaux but the term is also used in other areas and countries. The best wines from the best locations are used for the main wine. The philosophy and / or the criteria are quite different for each Châteaux and can also with each vintage to change. These are, for example, grapes from vineyards with younger vines (about 10 to 15 years), grapes from lower quality compared to the first layers, batches of the vintage, wines from the second pressing and wines from worse ones barrel samples, In bad years, it may happen that is dispensed with the production of the first wine, such. For example, in 1987 Château Lafleur and 1991 at Château Cheval Blanc, Especially in very good years, the second wine often offers a much better price-performance ratio, because the Grands Vins cost at least twice. Only since 1993 is it permitted for the second or third wine the additional designations Chateau or Domaine to use. The quality of the second wines can be quite different. For individual houses, it reaches top class. 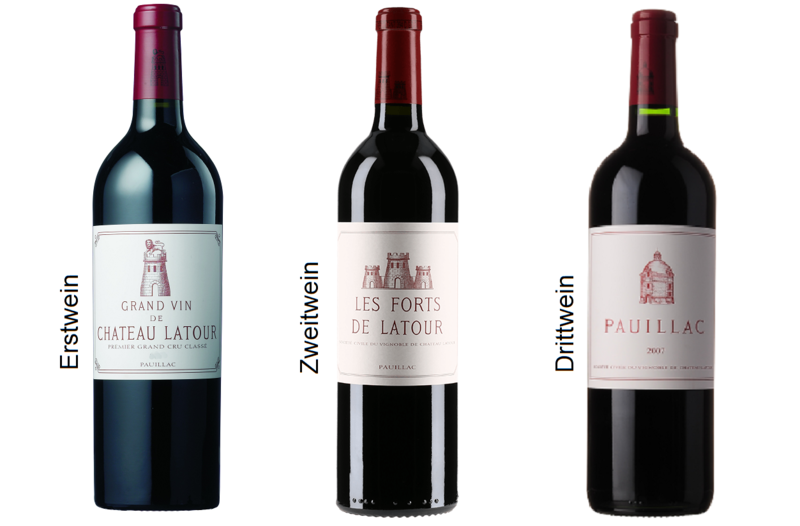 For example, the second wine "Les Forts de Latour" of the Château Latour Very close to the quality and also the price of a "Deuxième Cru Classé" châteaux (above in center of picture). For other producers, these wines are of very simple quality. As a rule, the second wines have less flavors. alcohol content and tannins opposite the main wines. They are mostly fruity, Softer in the structure and also much earlier enjoyable, that is less durable. The handwriting of a house is also very often in the second wine to full advantage and in the top châteaux you can expect the best qualities. Not a few wineries aspire to a certain extent typicality (Brand recognition). This sometimes leads to the result that even surplus lots of very good wine are ultimately not fully incorporated into the Grand Vin, because in very good years the wine would stand out too much from the other years. This means that even the best qualities can flow into a second wine. A good example of this is this Château Léoville-Las-Cases, in which the second wine from good years almost reaches the quality of Grand Vin. For the secondary wines, however, is not the highest quality, which in the Bordeaux classification 1855 awarded rank. That's why they have a different name, so they can not use the name of the Châteaux on the label. This page was last modified at 9 February 2019 at 18:49.